This is a brainstorming post. These skills are in no particular order. 1. Learn to identify exit routes. Here “exit routes” is a general concept. Mice and rats are great at surviving in urban environments. Unfortunately, for them, they often succumb to traps. They go in one way and can’t get back out. Raccoons too go in one door and can’t get back out. As humans, we should at least have one leg up on mice and raccoons. A major fire in a Brazilian nightclub killed hundreds of people. There was only one exit and a security guard refused to let patrons leave. Panic caused people to stampede the exit clogging it with bodies. Whenever you enter a building, find out where the exits are. Look around. Try to have at least two ways to leave. Is there anything preventing you from using the exit? How would you overcome it? If you’re driving down the road, same concept. If the car in front of you suddenly stops or crashes would you have an empty lane to enter if you needed it? Always have an exit route. 2. Learn to collect rainwater from your roof. You’ll probably never need this skill and your stored water will see you though most disasters. But if you had to provide your own water in an urban environment for an extended time, rainwater is heaven sent. No pushing and shoving at the nearest river. Many wilderness survival experts focus on securing food. It’s often assumed a source of water, like a stream, can be found and that it will be relatively clean. In a city during a disaster, rivers can be quickly polluted. 3. Learn to pay attention to what’s behind you. Again, a general concept. Unlike flies, humans don’t have a good perception of what’s going on behind us. This makes us vulnerable. Criminals could come up from behind and punch us. Crazy people could push us onto subway tracks. Even if we gave ourselves adequate braking distance, the car behind us might not have. In a true story, a school bus driver about to let children off his bus noticed the car behind him wasn’t slowing down. Rather than let the kids off the bus he decided to move forward. By doing so, he reduced the impact speed when the car behind him crashed into the back of his bus. This action was credited with saving the young lady’s life who plowed into the back of the school bus. How many of us can honestly say we pay that much attention to what’s happening behind us? 4. Learn to jump start a car. In cold winters, especially, batteries die. You’re likely to be the good Samaritan on this one, helping others. For extra credit, learn how to load test a battery. I assume you already know how to change a tire. 5. Learn to pay attention to where your hands are. I watched a video with one of my favorite Youtubers cooking. For a second I saw him reach into a plugged-in blender. Moving machines mangle fingers. Be especially careful of things that were once moving, but have come to rest unexpectedly, like snowblowers. Pay extra attention to things where some other person could start the thing moving unexpectedly. This point is just as important to those operating farming equipment as urban preppers. In another video, a fellow somehow got one of his fingers in front of a gun barrel while target shooting. He shot his own finger off. If you’re unfamiliar with some dangerous device, follow the general rule given to kids in museums: Don’t touch. For those with long hair who work around machinery, tie your hair back. In a horrible accident, a young engineering graduate student got her hair caught by a lathe. The general concept is just to keep body parts away from danger. This is why we stay away from really bad neighborhoods. All our body parts are in danger! 6. Learn to earn extra money. In many emergencies, cash is king. It’s not as romantic as trading gold Krugerrands after the apocalypse, but if you lose your job, you can pay your electric bill. Money is a lot like football. There is offense and there is defense. Most preppers are outstanding at defense. They’re naturally frugal. They’re often hard-core do-it-yourselfers. But, for any given lifestyle, you need a certain amount of income. Fall below this, and you’re on a path to financial ruin. In an urban environment, it’s nearly impossible to live without adequate income. Can you invent and sell something? Jeffrey Nash invented the juppy, which is like clothing with handles to help parents teach babies to walk. Do you have a juppy-idea floating around in your brain? 7. Learn to think on your feet. This is easy for some people, harder for others. Try to quickly come up with multiple possible solutions to any problem. Look at options and try to find the best one. Thinking on our feet is difficult for many of us, because we’re stressed because we lack a lot of time. Being able to think while highly stressed out is a valuable skill. 8. Learn there are bad people out there…violent criminals, mentally ill people who want to harm others, sociopaths, etc…. 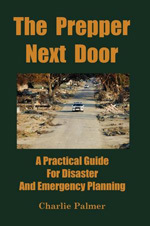 In the book I write about how our own safety can be compromised by others living very near us, because they don’t pay attention to fire safety and the possibility of arsonists. If an arsonist sets fire to a pile of bush and it burns down several garages and homes, a common response of those affected is: “Who would do such a thing?” Who knows? Some wacko… You don’t need to know which wacko, only that there are wackos. 9. Learn to notice anybody paying attention to you. This skill falls under a general category of surveillance and counter-surveillance. In a recent post about burglaries, I wrote about how criminals will look for homes without vehicles around. They’ll look in your garage to see if your cars are there. Higher-end robbers are even known to place GPS tracking devices on a family’s cars to see when they leave home. Some security experts suggest you go to Google Maps, enter your address, hit the “report a problem” link, and ask to have your house’s street view blurred. This data isn’t in real time, but it can give a stalker the layout of your grounds. Now, I’m not suggesting you purchase a slew of expensive counter-surveillance stuff or try to shoot down Google satellites. But do pay attention to unknown vehicles with people sitting in them or to people hanging around your house. Seek to deny wrongdoers information about your habits and schedule. Feed them false information with an automatic light timer or by leaving your TV on when you leave home. Information will usually proceed action by both good guys and bad guys. In a recent hostage situation, a bad guy in an underground bunker was defeated because the police were able to place a hidden camera inside the bunker. This alerted them to his position inside. When they were able to get him to approach the bunker’s door, they blew it open and stormed in. Without adequate information, the hostage might have been at the door. If a true long-term WROL happened and a gang wanted to assault your domicile, they’d first gather all the information they could before making their attack. I’ve never understood the interest in purchasing shipping containers and burying them underground as a survivalist shelter. If assaulted, you’d be trapped like a rabbit in hole. Without some surveillance system, you’d have no knowledge of just what was happening outside. Even before the successful police raid, people on news websites suggested police try putting sleeping gas down the PVC air pipe to the small bunker. If mutant zombie bikers discovered your PVC air pipes, they could plug them up or toss gasoline and a match inside. That would be a dismal end. Digging yourself into a box underground violates the first rule above: Have exit routes. 10. Learn just a bit about small unit tactics. Again, this is something you probably won’t need. But learning a bit could help you if WROL happened. Unless everyone in your group is military or police, detailed plans and methods are just too much. I’d keep it simple. Keep these three things in mind. First, seek cover and concealment. Unless you must change position, sit tight, hopefully behind something that will stop a bullet and will conceal you. You’re more visible when you’re running around. It’s safer to hide behind things. Second, don’t get bunched up. This violates the basics of Lancaster’s law. If you and your buddies are in a clump, an attacker can shoot in your direction placing you all at risk. If you’re a bit spread out, attackers must at least decide who to shoot at. This makes their shots less effective. Third, don’t shoot the guys on your team. This is obvious, but important. Even professionally trained military have many friendly fire casualties. Those of us who aren’t professional military would be even more at risk of these accidents. If you and your team must move in a line and come under fire from the front, the tendency is to want to shoot back. But if you’d be shooting past six of your own guys to reach the enemy, that’s likely to lead to disaster. You must learn not to shoot when it places your own people at risk. For learning more about defending your home, I recommend Prepper’s Home Defense by Jim Cobb. If you want experience with small unit tactics without joining the military, look into the sport of airsoft or paintball. Well, this post has become way longer than I originally wanted. This is my brainstorming of ten urban survival skills. What skills would you add? The idea for this post came from a “ten things to learn for life” post, which I think was very well written. Another good take on urban survival skills. I’ll classify this one as “if you can’t beat them, join em.” A man outsourced his own job to China and sat at work watching cat videos. A short pdf about military patrols.